Update: this article has been updated the clarify that this is the largest exclusive Cadillac dealership opened under the new dealership design architecture. 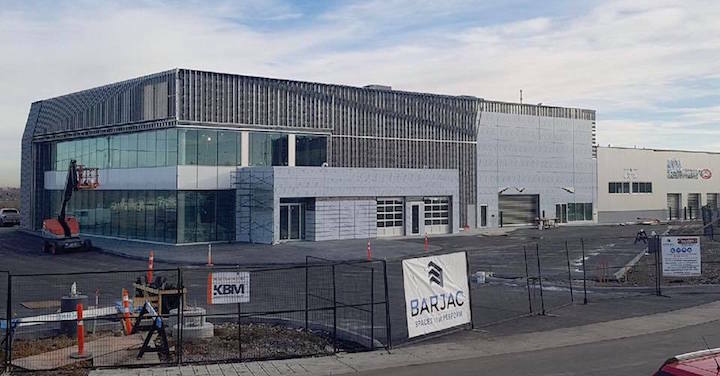 The first wholly exclusive Cadillac dealership under the new dealership design architecture in North America has just opened in the Canadian city of Calgary, Alberta. You might have thought the first standalone Cadillac dealer in North America under the new design layout would have been opened in Michigan, New York, Texas, California or another populous American state, and we wouldn’t have blamed you. But with the opening of Carter Cadillac’s new location, the first (and the largest) standalone Cadillac dealer is actually located north of the border. The dealership is a three-storey, dual-showroom, 50,000 sq. ft. facility with a floorspace dedicated to Cadillac’s V-Series line of high-performance vehicles and other notable vintage cars from Cadillac’s history. It also features state of the art tech such as a virtual reality showroom and solar-powered electric vehicle fast-charging station. Carter Cadillac has a full-service concierge desk with vehicle pick up and return as well, building on the luxury experience it hopes to deliver to customers. Carter Cadillac is open for business in Calgary now. We’re sure the employees wouldn’t mind if you just wanted to stop by to check out the vintage cars and V-Series cars, either. Actually the stand alone dealers often are in rural areas or low population areas. There are more smaller dealers and they have no competition for often many miles. The metro dealers are often very competitive with other local dealers and they survive on multi brands. http://www.davetowellcadillac.com/ Has thrived in a down town area miles from other Cadillac dealers since 1912. The same for a near by GMC solo Dealer. It is opposed to logic but that is how it often works. Except that Calgary isn’t a small town and has an awful lot of wealthy individuals living there. This makes sense putting one here. They’ve been trying to do this in Vancouver but the cost and availability of land is a huge issue. The only way it could work in downtown Vancouver is to set up as a boutique with example cars. This means a smaller showroom, no inventory, no parts counter, no dealers (thankfully), and only examples of the available trim, paint, and interior options. Much smaller footprint. Lower rent costs. No inventory management fees. No dealers trying to upsell. And Cadillac gets a presence in a dense urban core that a conventional dealership could never get into. Calagary is not big in American terms. It is about the size of Birmingham Al. Also once you get out of town there is a lot of open area vs America were the space between many cities are filled in with more people. Yes property cost in Canada are also as bad or worse than California. It is just insane. If you believe Wikipedia then Calgary has a population around 1.2M. I think their might be a dozen cities in America that are bigger. Also, everyone in Alberta loves the wide open spaces between towns and cities. Property is very expensive in Toronto and Vancouver but the rest of the country is tied fairly close to the average wage of most of the residents in each city. Calgary is no different. Absolutely untrue! Just another in a line of poorly researched articles you guys come up with. Its been there longer than that, that was Schooley Cadillac of The Palm Beaches for many years before Autonation bought it, that building originally dates back to the 1970’s, I had a 1978 Eldorado that was sold there new. There are several stand alone Cadillac dealers in South Florida, Bayview, Coral, Ocean, Ed Morse in Delray. Thanks for Clarifying, I couldn’t remember the name who owned that building before Autonation. I was born in ’88 and remembered that was always a Cadillac dealership for as long as I could remember. FAKE NEWS: Cadillac Laval in Montreal has been a stand-alone for at least 11 years. If it’s FAKE NEWS?…. then how about you fill us in about the details of the “new dealership design architecture”??? You’re a day late to the party, cowboy. Sam and/or Manoli went in and edited the story several hours after it was first published. But only after their error was pointed out. The story as first published proclaimed that Carter in Calgary was the first ever stand-alone Cadillac dealership in North America. Something that is demonstrably erroneous. And fake news. Only after the fact – and without apology – was the story corrected to explain that Carter is the first stand-alone Cadillac dealership using the new architectecture. Now as amended, no longer fake news. Nice backtrack! Hope you were able to clean your shoes up from what you stepped in. Hey why so hostile? It’s a free site doing the best they can. And doing it very well I may add! Their dealers have a very long way to go to come remotely close to the customer svc / experience at Mercedes dealers. My local Cadillac dealers are all arrogant idiots and are located in suburbs. The Mid/Town area and slightly further North is where all the $$ is and where MB has a dealer. I see more Tesla’s here than Cadillacs… I think the hill is to high and Cadillac is never going to retake the luxury leader crown. Well just makes me more angry, Here in the Windsor and Essex County we have one Cady dealer its ridiculous its a 0ne hr. our drive for me. Well I do trust them i had a battery/electrical problem had me running back and forth for a almost 2 years oh drive it there is not anything wrong well 2 new batteries latter it seems okay ya now that the warranty is up! My point is here in Canada they should let Chevy dealers sell or at least fix Cady’s. Not going back to them for another car!! !